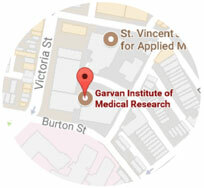 The Garvan Institute of Medical Research is lauching a new electronic learning module to help bring genomics to the clinic. A newly identified brain pathway could be the key to activating more brown fat, and burning excess energy before it turns into harmful fat. The Garvan-led UNSW Cellular Genomics Futures Institute is set to accelerate research in cellular genomics and single-cell sequencing – and to uncover new targets and treatments for disease. The Garvan Institute of Medical Research congratulates Dr Andy Philp who has been awarded the Al & Val Rosenstrauss Fellowship, generously provided by The Rebecca L. Cooper Medical Research Foundation. The Medical Genome Reference Bank, a database of the genetic information of 4000 healthy elderly Australians, is nearing completion. A new study is the first in the world to sequence the entire tumour DNA of African men with prostate cancer, revealing significant differences compared to the tumour DNA of those of non-Africans. With almost 2 in 3 Australian adults overweight or obese, the risk of developing type 2 diabetes is significantly increasing in our nation. Citizen science speeds up cancer research. A new study reveals that fat tissue may play a crucial role in the progression of diabetes, challenging long established notions about the root causes of this modern epidemic. Dr Dan Suan (Immunology Division) has been awarded an Incubator Grant from MS Research Australia to explore the population of immune cells that go ‘rogue’ and attack the brain in people with multiple sclerosis.